The health of your gums is just as important as that of your teeth, which is why you need regular dental care to prevent damage due to gum disease. David De La Garza Jr., DDS, provides dedicated periodontal care in San Antonio. It is our priority to protect the foundation of your oral health by treating gum disease and its more advanced form, periodontitis. If you haven’t seen the dentist for some time, or are experiencing discomfort in your gums, please contact us today for an appointment. 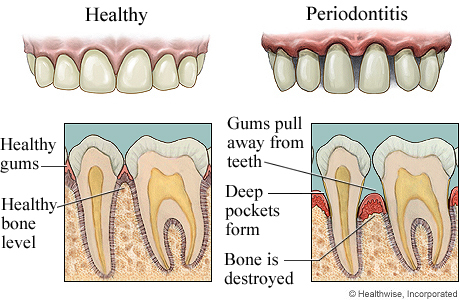 Why Do I Need Periodontal Treatment? If you have gum disease, we will prescribe the most appropriate treatment. When you visit our San Antonio dental practice, our dentist performs a thorough exam of your gums. We check their health and measure the depth of gum pockets around teeth. Using digital x-rays and intraoral cameras, our dental team takes detailed images of your oral structures to accurately see the progression of gum disease. With a proper diagnosis, our dentist will recommend the best treatment that addresses your oral health needs. Dr. De La Garza is skilled in performing root planing and scaling, which is a tried-and-true procedure that removes bacteria and harmful tissue from beneath your gums. This deep cleaning technique is often successful, especially when patients brush and floss regularly. Over the span of a few appointments, root planing and scaling will help eliminate infection and promote a clean and beautiful smile. We also perform gingivectomies, which are reserved for more extensive bacterial infection. After addressing the problems caused by gum disease, we then apply cosmetic improvements to restore your smile’s appearance. To prevent future infection, we educate patients on proper hygiene and strategize ways to adjust home-care. We hope to make home habits easier and offer solutions that allow you to obtain your best smile. When your periodontal needs exceed our care capabilities, our San Antonio dentist relies on a trusted periodontist who upholds the same quality standards of care we have for our own patients. Our practice has relied on this specialist for over twenty years. For more information about gum disease treatment in San Antonio, contact Dr. David De La Garza and his team today and schedule an appointment!